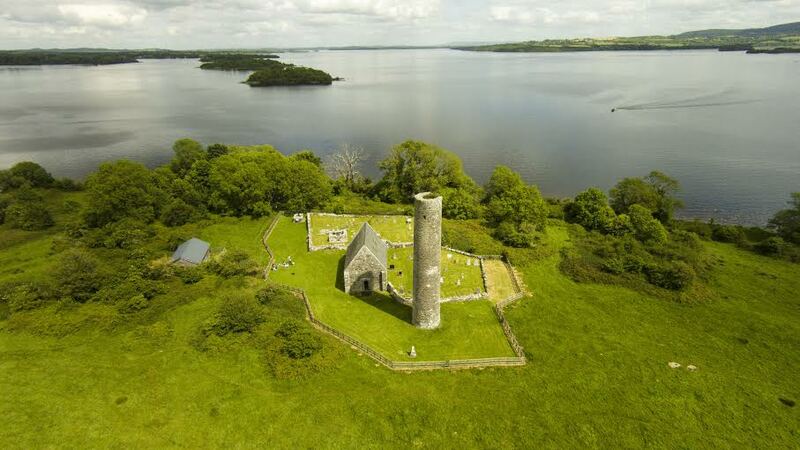 In the middle of Lough Derg is a solitary, uninhabited, 49 acre island whose atmosphere takes visitors back to the golden age of Irish Christianity. St Caimin founded a monastery here in the 7th century. It grew to be a large establishment, the well preserved remains of which include five churches, a cemetery and a 79ft Round Tower. Some 80 grave slabs lie in the cemetery, none later than the 12th century. One cross-base is inscribed ‘the grave of the ten men’ – perhaps victims of a Viking raid. Nearby, stones from a square hardly larger than a playpen – once a hermit’s cell. There are several hollowed-out stones called bullauns, possibly used for mixing herbs, and a ‘bargain stone’ with a gap below it through which mainlanders and monks shook hands on a sale. The 10th century Round Tower is complete except for its conical cap of a roof. According to tradition this tower never had a roof, because an old witch refused to bless the mason’s work as she passed by. The furious mason hurled his hammer at her and the witch was turned to stone, but he was unable to finish the roof. The pilgrimage to Holy Island was famous. A penance of several circuits of the monastery earned sinners absolution, but it was believed that only true penitents could see their reflection in the island’s holy well at the end of the round. Those who did not see it in the water had to renew their penance until they did. Holy Island is a must see attraction on your Ireland tours.